Wind turbines off the coast of Dronten, the Netherlands. Cape Wind has asked state regulators for more time to revive its stalled project after the state’s two major utilities backed out of buying power from the proposed offshore wind farm. 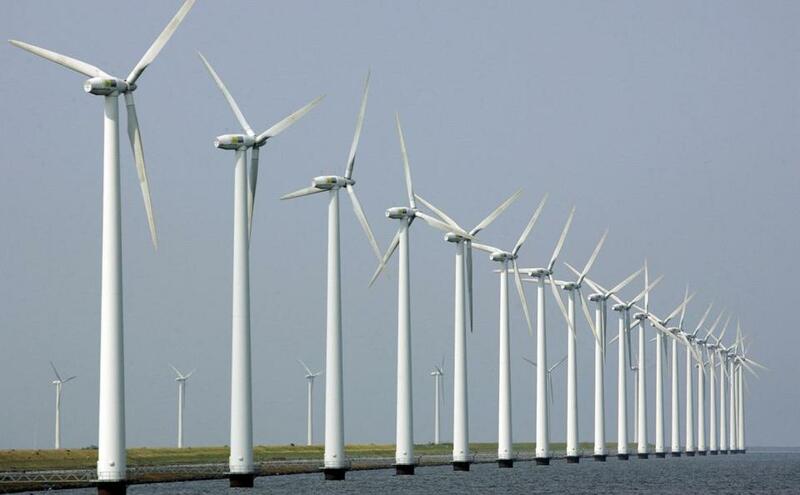 The wind farm’s developer was supposed to begin construction by May 1, but just before the deadline, it asked the Massachusetts Energy Facilities Siting Board for a two-year extension. Cape Wind Associates LLC said it needs additional time to work through the mountains of litigation facing the project, while trying to persuade the two utilities to reactivate contracts critical to financing the $2.6 billion construction. The state has agreed to suspend the May 1 construction deadline until the Siting Board rules on Cape Wind’s request. Dennis Duffy, Cape Wind’s vice president of regulatory affairs, said Thursday that the company should qualify for the extension. “We plainly meet the Board’s standard for extension of previously granted authorizations and are confident of success on the merits,” he said. In January, National Grid and Eversource Energy canceled long-term contracts they had signed with Cape Wind to buy 77.5 percent of its output because the company missed several key milestones. At the time, the wind farm developer disputed the utilities’ ability to terminate the power deals, saying that “relentless litigation” from opponents of the project had activated a clause in its contracts that would give the company more time to get the project underway. Cape Wind has said it would try to resolve the issue with the utilities, but at least one of the electric companies, Eversource, said that it had yet to hear from the wind farm developer. “We haven’t spoken or met with Cape Wind, and there’s no change in status to report on our end,” said Michael Durand, an Eversource spokesman. National Grid did not respond to a request for comment. In its 14-year history, Cape Wind has repeatedly needed construction deadlines extended as its struggle to finance what would have been the first offshore wind farm in the United States while battling fierce, well-funded opposition. Located in Nantucket Sound about five miles off of Hyannis, the wind farm would include 130 turbines, each 258 feet tall, spread across some 24 square miles. After the two utilities backed out at the beginning of the year, Cape Wind lost its lease for a construction staging area in New Bedford Harbor and dropped plans to use a second work area in Rhode Island. The company is also battling the Town of Barnstable, which has sued to block Cape Wind from using land in the town for electrical equipment related to the project. Barnstable has also asked the Siting Board not to grant Cape Wind the two-year construction extension, as have activist groups representing residents, fishermen, and businesses that oppose the project. “The absence of power-purchase agreements” with the two utilities “makes the project figuratively — and I guess literally — dead in the water,” said Charles McLaughlin Jr., assistant counsel for the Town of Barnstable. •Michael D. Goodman: Can we make the tough decisions about energy? Jack Newsham can be reached at jack.newsham@globe.com. Follow him on Twitter @TheNewsHam.